A get-together was organized by the Samson Rubber Industries (DSI Tyres) who are the local importers and distributers of reputed HAIDA Radial tyres for those retailers who has successfully selling the brand around the country. The event was held under the patronage of the representatives from Mother Company where HAIDA tyres manufactured at Heritance Kandalama recently. At this special occasion, legal documents pertaining to the agreements were exchanged between the Samson Rubber Industries and the HAIDA mother company which would make DSI Tyres the sole distributor of HAIDA Radial Tyres in Sri Lanka. Qi Juntao (Ted) and Ren Dezhi (Alex) attended the event representing the Mother Company. Successful retailers and their family members had the chance of spending a luxurious holiday at Heritance Kandalama. “The Samson Rubber Industries was made the sole distributor of HAIDA tyres in Sri Lanka due to few special reasons. They who has over 30 years of experience in the field has one of the best distribution network in the country. They have been able to acquire a bigger market share in the local market by selling bicycle tyres, motor cycle tyres, three wheeler tyres and agricultural tyres and tubes and they are exporting these tyres to over 60 countries. We are prepared to facilitate anything to make this joint venture a successful one,” Alex said while expressing his views on behalf of the HAIDA mother company. 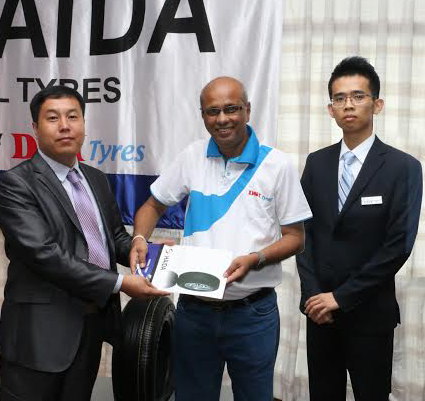 Managing Director of Samson Rubber Industries (Pvt) Ltd Mr. Ranatunga Rajapaksha said they started distributing HAIDA with the intention of giving a quality and trust worthy radial tyre to the local market at an affordable price. He also said that as a company they are extremely happy to cater to the needs of local customers by distributing HAIDA radial tyres and that will take steps to further strengthen local market for HAIDA. Members of the director board of Samson Rubber Industries were also present at the occasion.